If anyone hasn't seen the blog, check out shutupaboutbarclayperkins. Your source/guide to everything historical and special about beer/brewing. So, why tackle something a little more historical? REASON: I had a vial of WLP645 (Brettanomyces Clausenaii) to use up and a Brown Ale/Porter to get going for the most recent NHC. Historically, Porter was a very popular style of beer. It has been said that these beers, tended to have some form of bacteria in them. In the traditional english stlye stock ales, they suggest that Brettanomyces was present. Wild yeast like that was most likely present, as they didn't have the stringent sleaning and sanitation methods of today. With my ongoing obsession for brewing some sort of porter every year for NHC (November), in an effort to get a medal winning beer in a darker ale category (I really should rethink this hopeless effort *Sigh*). In the past 3-4 years I've had pretty dire results in the category, and to be honest, the base beer was no different, although scoring higher than the previous effort of 9/50 (don't ask). 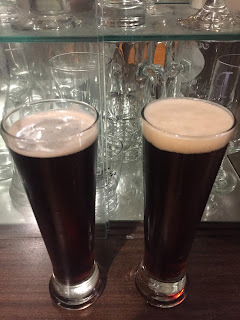 This year was no different, although I changed tact a bit, and going Brown Porter, rather than Robust Porter, and heading in a much more traditional direction than previously. and blow me down if I didnt get an average score of 19/50 (I'm happy based solely on the fact its double digits). Half and Half, Plain base and Brettanomyces aged (No Oak). with a twist of some Tart Cherries when racking onto the brett for extended aging. I hit 4 months before kegging it and giving inital tastes (I seemd to get a bit of almond and some cherry pie funk, and actual cherry taste. Its hard to decide how good this beer really is, because the base beer turned out so poorly (it was good enough in general, but maybe a bit too toasty) but now there'ssome age to it, because of my general lack of actually brewing beer (and drinking itfor that matter) its starting to take some real shape. 31 August 2016 - Temp Raised to 21 Degrees. for remaining fermentation. 11 September 2016 - Half Racked onto Vial of WLP645 & 1 kg of Frozen Tart Cherries. 11 February 2017 - FG on Brett section 1.004. Racked to Bottling bucket primed to 2.1 volumes also, using XXg Priming Sugar. Mouthfeel: Thin, but ok, considering, not going to win any awards. Again, carbonation takes away from it. Overall: Needs to be thicker, higher mash temp and more specialty malts should help. Flavour: Cherries again, not in your face, but there, the beer seems to be somewhat balance between malt and frit, which is nice, but still some of that astringency pokes through. The almond note is there again. Mouthfeel: Surprisingly thicker than that tandard version. Cherries lead again, so its still thinner than I'd like but its nice. Overall: Same as the base beer, but some additional cherries would be nice, to eliminate that almond note (maybe?) and thicken it up a bit. The recipe is still not as good as my normal English Brown ale, so I think next time, I';d go with that recipe and adjust from there.